Derived from the Shaolin Temple, most Kung Fu (gōng​fu) today still bears strong resemblances to the traditional Shaolin Kung Fu style. Bei Shaolin (Northern Shaolin) may have been the first branch of a Chinese martial art to branch off from the Shaolin Temple. The result from such spinoffs is a nearly endless series of styles with all their different forms, movements, techniques, and ideas about defense and fighting strategies. At the root of these myriad styles, however, is the original Shaolin Temple Kung Fu which is what is taught at our academy. Generally, Tai Chi (tài​jí​) was designed with Taoist principles in mind around 300 years ago. 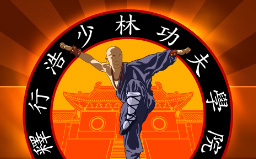 Though it originated through the Kung Fu atmosphere that the Temple made possible, and from a Kung Fu practitioner whose training came from Temple Kung Fu. Tai Chi can be both hard and soft, as well as both internal and external, though it is most commonly considered a “soft” style of martial arts. More dance than martial art, Lion Dance embodies a martial spirit and accompanies martial arts demonstrations given by most contemporary Chinese martial arts schools. Skilled performers go on to represent our school at Lion Dance performances. Our lion dancers form an important part of the Demo Performance Team we send to various locations to entertain and demonstrate authentic Chinese culture. If you are thinking about signing up for any of our classes, please contact us and schedule a time to visit. This first class is completely free, and with Shifu’s permission, you may participate in the class or watch from the sidelines. Click here to learn what you should know before coming to your first class!